Digital Ear can analyze a live or recorded solo performance (e.g. 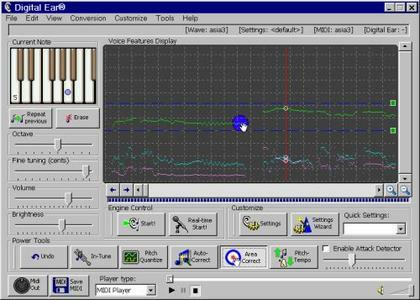 a singing voice, a saxophone solo, or any other musical instrument) and convert it into a standard MIDI file! This file can be played by any synthesizer with a different voice of your choice, or you can import it into your favorite sequencer or notation software (e.g. Cubase VST, Cakewalk, Sonar, Logic etc.) for mixing with other tracks, automatic transcription, or any further processing. Digital Ear reads standard audio (.wav) files or accepts live microphone input. Unlike conventional so-called «Pitch-to-MIDI» converters, Digital Ear will send high-resolution pitch events closely matching those of your original sound. Any vibrato, tremolo, pitch-bend, or portamento effects of your recorded sound will be faithfully converted into MIDI events that can by reproduced into any voice of your synthesizer or sound card. Only Digital Ear can capture the nuance and expressive power of the human music player or vocalist.